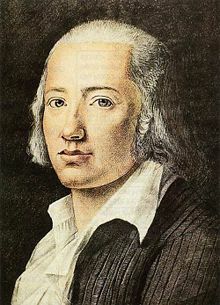 Johann Christian Friedrich Hölderlin (March 20, 1770 – June 6, 1843) was a major German lyric poet whose work draws on the classical style of Johann Wolfgang von Goethe and Friedrich Schiller. His early poems, like Goethe's and Schiller's, were written in imitation of ancient Greek literature; but as Hölderlin matured he began writing an entirely new kind of poetry that, while indebted to Greek mythology, also drew on the sprouting movement of Romanticism and on a mystical view of the world that was unique to Hölderlin himself. Hölderlin was a profoundly spiritual man. The stresses of being a poet (and an impoverished poet at that) ultimately took their toll on him, and by his mid-40's he collapsed into a state of relative insanity from which he never recovered. Hölderlin never achieved fame in his own lifetime, although his closest friends, among them some of the most influential poets and philosophers in German history, all regarded his work very highly. Having died a complete recluse, he would not truly enter the literary consciousness until nearly a century after his death, when he was rediscovered by 20th-century scholars. Since his rediscovery, Hölderlin, like his contemporary William Blake, has been viewed as one of the great "lost poets" of the Romantic era. Many now view Hölderlin as having been centuries ahead of his time; his poetry foreshadows many of the experimental turns that would be taken by modern and postmodern authors. He was one of the first poets in the German language to do away completely with rhyme and meter, writing in free, fragmentary, stream-of-consciousness verse that sounds remarkably like the avant-garde poetry of the present day. Like Blake, he also invented a personal mythology based on the Greek gods that scholars are still deciphering today. As time passes, it has become clear that far from being a lunatic and recluse, Hölderlin was one of the most gifted and misunderstood minds of his generation. Hölderlin was born in Lauffen am Neckar in the kingdom of Württemberg. He studied theology at the Tübinger Stift seminary, where he was friends and roommates with the future philosophers Georg Wilhelm Friedrich Hegel and Friedrich Wilhelm Joseph von Schelling. They mutually influenced one another, and it has been pointed out by some that it was probably Hölderlin who brought to Hegel's attention the ideas of Heraclitus regarding the union of opposites, which the philosopher would develop into his concept of dialectics. Others point to Schelling and the dialectical relationships he developed in The Deities of Samothrace. Coming from a family of limited means (his mother was twice a widow) and having little inclination for an ecclesiastical career, Hölderlin had to earn his living as a tutor of children from well-to-do families. While working as the tutor for the sons of Jakob Gontard, a Frankfurt banker, he fell in love with Gontard's wife, Susette, who would become his great love. Susette Gontard is the model for the Diotima of his epistolary novel Hyperion. Having been publicly insulted by Gontard, Hölderlin felt forced to quit his job in the banker's household and found himself again in a difficult financial situation (even as some of his poems were already being published through the influence of his occasional protector, the poet Friedrich Schiller. He was forced to accept a small allowance from his mother in order to survive. By this time Hölderlin had already been diagnosed as suffering from severe hypochondria, a mental condition that would worsen after his last meeting with Susette Gontard in 1800. In early 1802 he found a job as tutor for the children of the Hamburg consul in Bordeaux, France, traveling by foot to that city. His travel and stay there are celebrated in Andenken (“Remembrance”), one of his greatest poems. In a few months, however, he would be back in Germany showing signs of mental disorder, which was aggravated by the news of Susette's death. In 1807, having become largely insane, he was brought into the home of Ernst Zimmer, a Tübingen carpenter with literary leanings, who was an admirer of his Hyperion. For the next 36 years, Hölderlin would live in Zimmer's house, in a tower room overlooking the beautiful Neckar valley, being cared for by the Zimmer family until his death in 1843. Wilhelm Waiblinger, a young poet and admirer, has left a poignant account of Hölderlin's day-to-day life during these long, empty years. The poetry of Hölderlin, widely recognized today as one of the highest points of German and Western literature, was quite forgotten very soon after his death. His illness and reclusion made him fade from his contemporaries' consciousness. Even though selections of his work were published by his friends during his lifetime, his poetry was largely ignored for the rest of the nineteenth century. Hölderlin was classified as a mere imitator of Schiller, a romantic and melancholy youth. He would be rediscovered, by Norbert von Hellingrath, only in the early twentieth century. Like his contemporary William Blake, another poet labeled insane and ignored for centuries, Hölderlin has rocketed into the highest esteem since being rediscovered; he is now viewed by many scholars as one of the most innovative and gifted poets of his generation. One of the first changes has been a reassessment of Hölderlin's character. For years, many critics had written him off as an idealistic and infirm Romantic who laid in bed all day, either in madness or reverie, completely removed from the concerns of the real world. In actuality, Hölderlin was a man of action and a man of his time. He was an early supporter of the French Revolution—in his youth at the Seminary of Tübingen, he and some colleagues from a "republican club" planted a "Tree of Freedom" in the market square, prompting the Grand-Duke himself to admonish the students at the seminary. He was a great admirer of Napoleon Bonaparte, whom he honors in one of his early couplets (coincidentally, it should be noted that Hölderlin's exact contemporary, Beethoven, also initially dedicated his Eroica to the Corsican general). How my soul has loved you. Than I have ever known them. But never the words of men. I grew up in the arms of the gods. into the holy, sobering waters. the shadows of the earth? In his years of madness, Hölderlin would occasionally pen ingenuous rhymed quatrains, sometimes of a childlike beauty, which he would sign with fantastic names, such as Scardanelli. These late poems, full of "Homeric beauty,” were written in the asylum (the so-called "tower poems"). Some have suggested they were the crystallization of his thoughts, and thus the greatest part of his works. Some have even gone so far as to claim that his madness was a voluntary one. Such claims are generally dismissed as Romantic exaggeration today, though the critical evaluation of Hölderlin's tower poems continues to expand, with more than a number of poets and critics arguing that, though he may have been insane, Hölderlin's late works herald a style of poetry centuries ahead of its time that prefigures many of the tropes that would become essential for postmodernism. Among the fragmentary and sometimes incoherent poems of Hölderlin's are occasional gems which suggest that, even in the deepest throes of his infirmity, he was still capable of poetic greatness. One of the most memorable of these fragments is a poem that ends abruptly with a comma, suggesting the great saying of Basho: "The words stop / but the meaning goes on." Though Hölderlin's hymnic style—dependent as it is on a genuine belief in the divinity—can hardly be transposed without sounding satirical, his shorter and more fragmentary lyrical poetry has exerted its influence in German poetry, from Georg Trakl onwards, and his elegiac mode has found an apt successor in Rainer Maria Rilke. He also had an influence on the poetry of Herman Hesse. Hölderlin earned some negative notoriety during his lifetime by his translations of Sophocles, which were considered awkward and contrived. In the twentieth century, theorists of translation like Walter Benjamin have vindicated them, showing their importance as a new—and greatly influential—model of poetic translation. Hölderlin was a poet-thinker who wrote, fragmentarily, on poetic theory and philosophical matters. His theoretical works, such as the essays Das Werden im Vergehen ("Becoming in Dissolution") and Urteil und Sein ("Judgment and Being") are insightful and important if somewhat tortuous and difficult to decipher. They raise many of the key problems also addressed by his Tübingen roommates, Hegel and Schelling. Though his poetry was never "theory-driven," the interpretation and exegesis of some of his more difficult poems has given rise to profound philosophical speculation by such divergent thinkers as Martin Heidegger and Theodor Adorno. All links retrieved May 12, 2017. This page was last modified on 12 May 2017, at 22:16.